Nintendo has distributed more free in-game items to those playing The Legend of Zelda: Breath of the Wild, available through The Legend of Zelda: Breath of the Wild – Tips from the Wild News channel on Nintendo Switch. 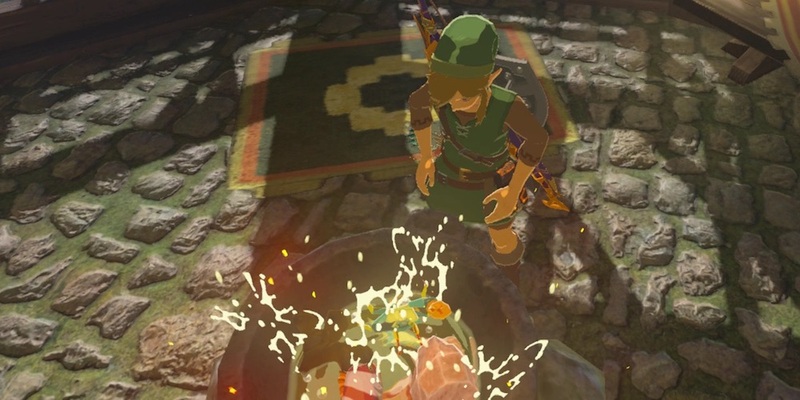 After early articles explained how you can befriend the dogs that you encounter, how to make Honey Candy, mucking around with the boomerang, tips on how to shield surf, and restoring rusted weapons, game director Hidemaro Fujibayashi has now provided tips on cooking dishes that boost your attack in Link’s open-air adventure. “As I’m sure you know, there are many ways you can prepare for facing down a strong enemy, and filling up on some good food is one of them! What do you like to eat before a skirmish, hm?” Fujibayashi asks. “Today, I’ll teach you how to make my favourite feast to get fighting fit which raised your attack power by three whole levels. Get ready for some Mighty Salt-Grilled Crab. “To prepare this fortifying treat, round up a Razorclaw Crab, a Mighty Porgy, a bunch of Mighty Bananas and some Rock Salt, throw them all into a cooking pot, and presto! You’ve got yourself a meal. Eat, fight, win, repeat. If you like the sound of that and want to try your hand at making this dish, then please accept this in-game gift of one each of the aforementioned ingredients. The items will appear in your game if you open it using the link below. Just make sure that you either have the game card inserted or the downloadable version of the software installed on your console. Nintendo once again adds that you must have obtained the paraglider before you can receive these items and that you may not be able to receive them at some in-game locations such as shrines and dungeons or on certain terrain.